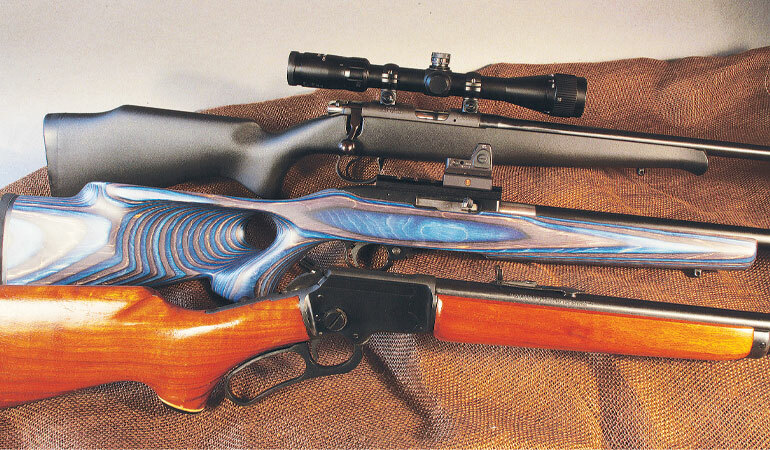 Three of Rupp’s current .22s include (from top) CZ 452, customized Ruger 10/22 and Marlin 39A. Right: Winchester’s Model 61 is a classy and classic .22 pump. The .22 rifle is a mainstay of any serious collection of rifles. We learn on them, practice with them, we take them to the fields and forests for small game, we compete with them. For some, they’re not “just” .22s; they are the only rifles that matter. As a former smallbore competitor, this was once true of me, although it’s not anymore. In fact, while testing a couple rifles that show up here in our special rimfire issue, I was reminded of how much I’d missed working with .22s. That got me to thinking about .22s I’ve had experience with over the years. Mom has never been much of a shooter, but she owns one of the finest .22s I’ve ever shot. Winchester’s Model 61 was the first gun I ever fired and the one I learned on. It is a pump (or, as some insist on calling it, a slide action) that Winchester brought out in 1932 and produced until 1963. I don’t know what year Mom’s was made, but I can still remember what it felt like to work that pump, the sound it made. It was in great shape the last time I saw it, and next time I’m home for a visit I’m going to take it out and shoot it. This was one of the first guns I bought with my own money. I didn’t have much cash, being too young to hold a real job. But between trapping, collecting newspapers, mowing lawns, etc., I had enough to buy the 572A version. Thing is, I always wanted—still want, in fact—the BDL model. The 572A Fieldmaster came out in 1956. It’s a pump (yes, I have a thing for pumps) with a nice balance, and it handled really well and shot really fast.The 572 was my squirrel rifle for many years, and I mounted a Redfield Widefield 4X on the grooved receiver. I spent a lot of time with the rifle over the years before selling it to my brother—who still owes me the money. This is the rifle I started my competitive career with. Savage imported Anschutz rifles from the early 1960s until ’81. I’m not sure where Dad picked it up, but I remember it fondly. Or rather I remember fondly all those nights in the basement of our high school, which held a rifle range and was also a fallout shelter. It was the home range for the local league my dad and his buddies shot in, and it started me on a career in firearms that would last a lifetime. Later, when I was in high school and could drive, I used to take the Model 64 for groundhogs because it was a lot more accurate than my 572. A pair of them, actually. The first was a 52C, which if I remember correctly was my dad’s, who’d moved on to an Anschutz by my mid-teens. My dad’s a smart guy, and once my shooting had progressed to a point he figured he had nothing left to teach me, he turned me over to shooting legend Elmer Schweitzer. Elmer bedded the 52C into a thumbhole stock he made, and that gun got me through my career as a junior competitor and my first stint as a collegiate shooter. Once I reached a certain level, I was one of the few shooters using the 52 in position shooting, everyone else having moved on to Anschutz. But in prone competition, especially at the National Matches at Camp Perry, the Winchester 52 was very much alive and well. Elmer had connections at Winchester, and I ended up the proud owner of a 52E action, the International Prone model. I bought a stock blank at Commercial Row at Camp Perry, Elmer finished it, and I had what I believe was one of the most accurate rifles on the line. At the time I was shooting for the Army, which gave me the opportunity to test a bunch of lots of ammo, and I found one lot of Eley Tenex that was just…well, tack driver doesn’t begin to describe how well it shot. I still have it—along with a Unertl 20X scope and a set of 1/6-minute iron sights made by Sam Gates—and one day I’m going to break it out and shoot a prone match again. When I somehow wound up at the U.S. Army Marksmanship Unit, International Rifle section, I was still shooting my 52C. So my dad cashed in his collection of silver dollars and bought me the top-of-the-line free rifle of its day. (A “free rifle”—as opposed to a “standard rifle”—is not subject to weight restrictions and features a thumbhole stock with all manner of adjustments.) I used the rifle for my stint at the USAMU and later as a member of the Eastern Kentucky University rifle team. Unfortunately, the team got the axe after what was my junior year in college, and that was pretty much the end of my smallbore career. Dad had one, and when he wasn’t paying attention I would borrow it to hunt squirrels. Yes, I liked my 572, but it wasn’t a great shooter, and the Marlin had such a great feel to it. 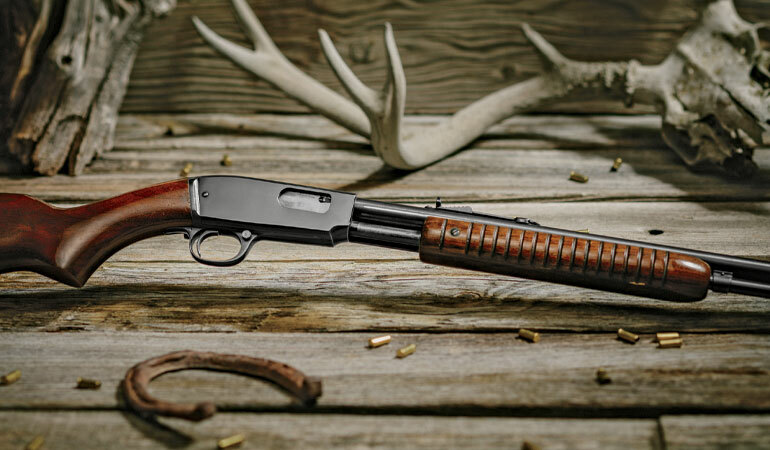 Instead of the whippy barrel of the pump, the heavier barrel of the Marlin made for a steadier hold, and it was a great-looking gun. After college I got my first real job, and I didn’t have a hunting .22. On the advice of my gun mentor, Pete Dickey, I drove down to Clark Brothers gun shop in Warrenton, Virginia, and bought a 39A. Initially I was disappointed because even though it was a Golden 39A, it lacked the gold-colored trigger Dad’s rifle had. But that aesthetic shortcoming aside, the rifle was great. It shot well and carried like a dream, and it survives as my primary hunting .22. I think I was editing Guns & Ammo when I had the chance to travel to the Czech Republic for a CZ factory tour. We also got to shoot, and I was introduced to the Silhouette version of the 452. When I got home I bought one. To be honest, I haven’t used the gun for its intended purpose—smallbore silhouette, hunter class—and I don’t shoot it as much as I should. But it’s got a terrific stock and is super-accurate. I think people tend to overlook CZ guns, and they shouldn’t. Bet you were wondering when this was going to show up. Everybody owns a 10/22, right? Well, growing up in Pennsylvania, we couldn’t use semiautomatic rifles for hunting, so the 10/22 wasn’t on my radar. That changed when I started working with Ruger on the company’s TV show, and my friend Ken Jorgensen convinced me to shoot what was then Ruger Rimfire—an action-shooting discipline. All I had was the CZ and the Marlin, neither of which is well suited to this sport, so I bought a basic 10/22 and used it for the match. I don’t like getting beat, even when I have no right to expect to do well, and I realized right away I was going to have to upgrade the 10/22 if I hoped to hang with the competition. I tried a couple different barrels and settled on Magnum Research’s Magnum Lite Graphite. It’s accurate, and its light weight makes target transitions a lot faster. For a stock I chose a laminate thumbhole from Boyd’s Gunstocks. For the fire-control system I turned to the firm pretty much everyone else does: Clark Custom. I bought the deluxe drop-in trigger and the speed bolt release. The replacement trigger was an improvement but not as big a boost as the bolt release. No more having to “hold your mouth right” to operate the release/bolt lock. So there’s my .22 history. I’ll bet a lot of you own or have owned some pretty sweet .22s. I’d love to hear about them. Drop me a line at rifles@out doorsg.com and tell me about your favorite .22 or a couple of favorites. I’ll run a sampling of them in future issues, and if you’d like to be included, please include your name and town and state of residence when you submit your favorites.